The raw data for this article is available in a publicly-shared database in this Google Sheet, which you can access to see additional details. 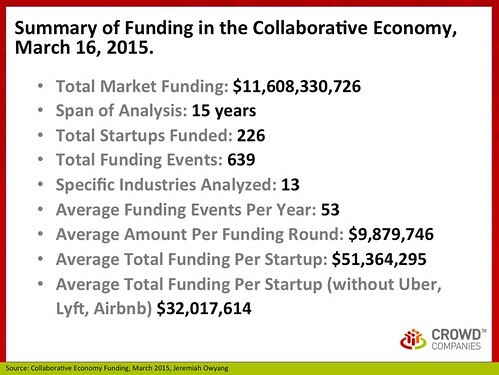 VCs, investors, and banks have increased their bets on the Sharing/ Collaborative Economy in greater amounts than ever before. 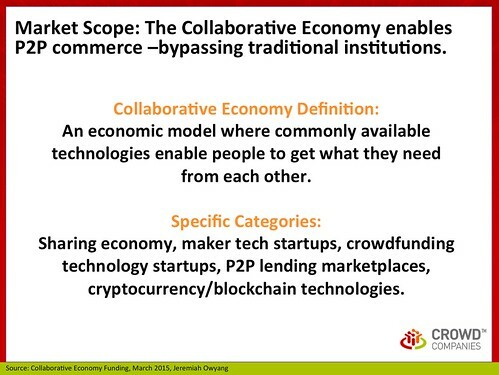 The Collaborative Economy is an economic model that uses commonly available technologies to enable people to get what they need from each other. 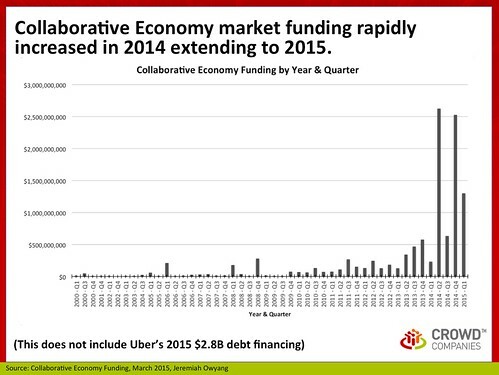 You’ve likely heard of the sharing economy, crowdfunding, P2P lending, the Maker Movement and cryptocurrencies. Each of these is a part of this emerging economy. I’ve met with many investors to find out what they like about this space. They’re generally seeking fast-growing, two-sided marketplaces of buyers and sellers, riders and drivers, and hosts and guests that involve frequent revenue transactions. Just as eBay and Craigslist own none of the products offered on their sites, these new startups use technology to find idle assets and connect buyers to them, reducing costs for all parties. Above: Let’s first define the scope and give examples. This market enables people to get what they need from each other, often not from traditional commerce methods. Above: Funding has increased year-over-year. 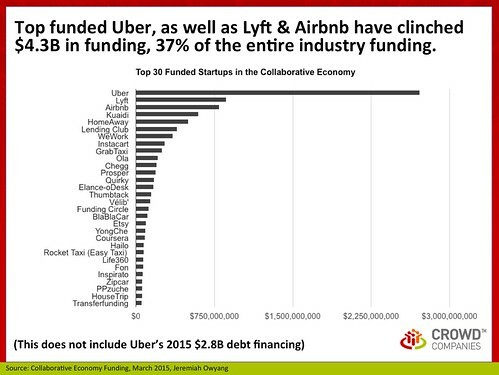 Above: Uber, Lyft, and Airbnb have clinched the most funding. 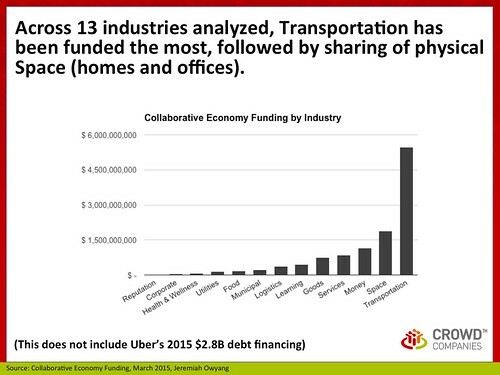 This does not include Uber’s recent billions of debt financing. Above: Transportation funded above all other industries as expensive, idle goods can be more efficiently deployed. 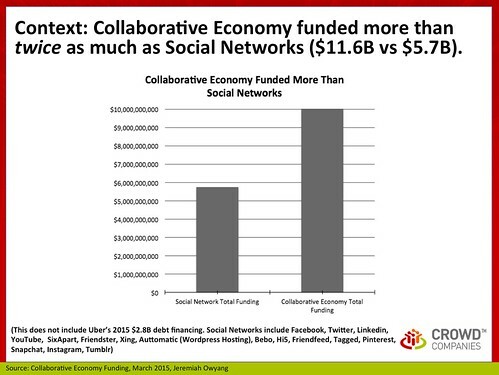 Above: Social Networks, the first market of digital sharing, raised only half the amount of the Collaborative Economy. Above: This influx of funding poses risks to the ecosystem. Looking beyond the raw data, what do these trends tell us about this market? Bigger than Social Networks. It is astounding that these startups have been funded by more than twice the amount raised by consumer social networks like Facebook, Instagram, Friendster, YouTube and Myspace. This is a very large market, and it is disrupting traditional business models. These startups are trying to find those niches. Take transportation, for example: BlaBlaCar is spreading across Europe and Asia, Lyft is focused on the United States (India and China have produced their own versions), Sidecar is adding package delivery and Uber is spreading globally. Transportation, disrupted. Transportation has received the most funding as this market is ripe for disruption: cars, boats, and planes are often expensive, cities are becoming dense, and these assets are infrequently used by their owners. Not all will last, but this market is not going away. While these startups won’t all last, they are trying to establish themselves in their niche markets. With all of the funding being poured into them, it means that they are not all going to go away – at least not for the next few years. Some of these startups are in a conundrum. For those that will stand the test the time some have taken on incredible amounts of funding, and now must balance out the needs of the community (their customers who rely on their service for their livelihood) as well as return money back to their investors within 5-10 years.